It happens mostly in real time. Like if there’s a run within an act and there is, say, three characters involved that I do, and then there are some others that other people do, I’ll just keep reading through the script — one character, and then if another one pops up, I’ll do that in real time. We try to get a whole scene done, so I shift gears a lot. West also shares the secret of nailing the Popeye voice, which has to do with emulating dual-toned Tuvan singers (skip to 17:00 on the audio, found by clicking “Listen to the story” at the top of the article page). 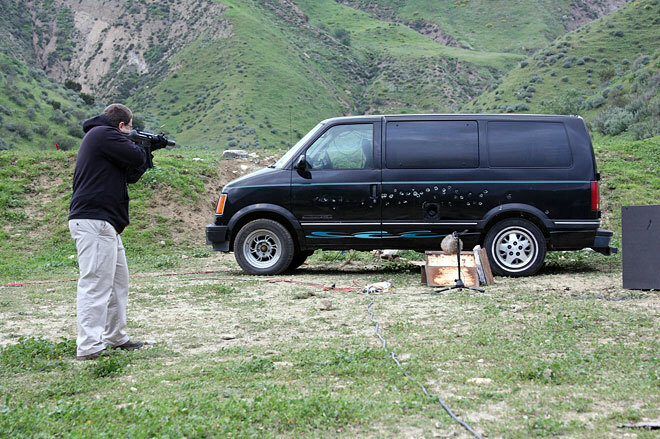 The field crew nabbed a van off Craigslist.com and took it out to the Mojave desert to record ricochet sounds. Grabbing the full dynamic range of bullets hitting, puncturing, and bouncing off the van called for recording rigs at the point of impact and sometimes as far as 100 yards away. Recording audio effects for Inception. Follow the link for more, including video of some car-sound recording (but not the gunfire, sorry).